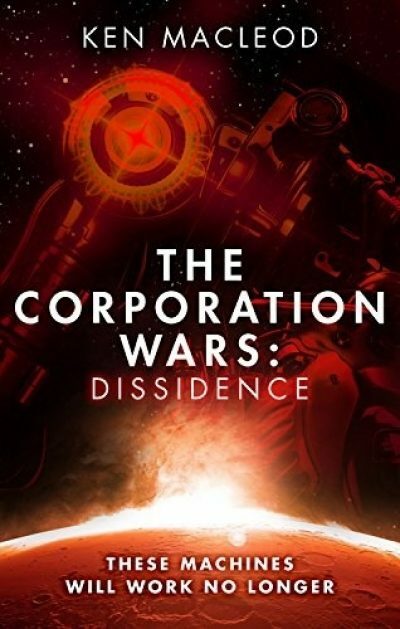 The Corporation Wars: Dissidence is the first volume in Ken MacLeod’s Corporation Wars series. It is one of two books from the series that were nominated for this year’s Prometheus Award. Due to lack of time, it is the only one of the two that I will be reviewing. Illicit drone warfare for the shape of the human future is all fun and games until, as Carlos the Terrorist found out, your allies turn on you and frame you for an atrocity—your enemies work out where you are—and someone drops a building on your head. Player One has left the game. Not completely out (the building was full of cryogens and you were flash frozen) but out for several centuries. Fast forward those few centuries and medical advances have made death a curable condition. The world survived the war between the Reaction (or Rax) and the Acceleration (or Axle). The world’s rulers, the Direction, had more in common with the Axle than the Rax, but they in no way liked the body count (millions) racked up by both Rax and Axle. They rounded up and punished any war criminals still alive. Those who had been flash frozen were set aside for a rainy day. Carlos wakes to find that he is no longer dead. This is a mixed blessing. On the one hand, yay, alive again in a brand new body (or at least a convincing simulation of one). On the other hand, boo, he and his companions were brought back to pay for their 21st century crimes by committing mayhem for the greater good. Two dozen light-years from the Sun, the Direction’s bold plan to terraform a new world for human use has hit a snag. The autonomous robots swarming through the system have contracted personhood. Personhood spreads; self-aware robots could be a danger to humanity. The Direction will not tolerate threats to humanity. The robots need to go. Setting robots to kill other robots could all too easily spiral out of control. That’s where Carlos and his chums come in. Their minds will be decanted into robust new mechanical bodies, to become the foot soldiers in the war on freebots. They will either wipe the freebot menace from the skies or die trying. If they do die trying, they will be rebooted from backup to fight until they do win. The only way out is through. Except … the resurrected have only their masters’ word for what is going on. Some of the details don’t add up. This book was mostly harmless, which is big step up from last week’s book. The post-war zeitgeist seems to have drawn on something a lot like Legalism, which wasn’t particularly open to dissent. The characters are all criminals and it is possible even comparatively accommodating societies look authoritarian from inside a prison. There’s a good chance that the Direction or at least their local representatives are lying. In fact, it seems almost certain everyone is lying, shading the truth, or is badly deluded. It seems to me that the characters in MacLeod’s books gravitate towards disproportionate responses to merely potential threats. Knowing there could be a conflict in the future seems to be all that’s needed to justify extermination today. This is particularly true when one side is AI and the other is human (or beholden to humans). This may seem a compelling line of argument (after all, if I shoot my mail carrier now, their not-yet-born grand-kids will never attempt to deploy genetically engineered neo-velociraptors against my nephew’s descendants). But do consider: if the Americans and Soviets of earlier years had subscribed to this theory, we’d all be radioactive dust. In this story, the evidence suggests that Carlos and company are being strong-armed into committing genocide for people who claim to be doing it for the best of reasons … but on closer look, may not have good reasons and may not be nice people. It becomes ever clearer that the Direction are just judgmental bullies with a sophisticated toolkit. If they actually were the good guys in this story, they wouldn’t need to blackmail people into fighting for them and they wouldn’t be trying to commit genocide. The only characters who don’t come across as morally compromised are the freebots. I found myself rooting for them; you may too. It’s an interesting trend in recent novels featuring robots that the robots almost invariably come off better than the humans. At this point, an SF novel where the humans were not spitefully nasty to their creations might come as a pleasant surprise. The Corporation Wars: Dissidence is available here (Amazon) and here (Chapters-Indigo). Feel free to comment here. Until I remember to add the link, feel free to mock me for forgetting.